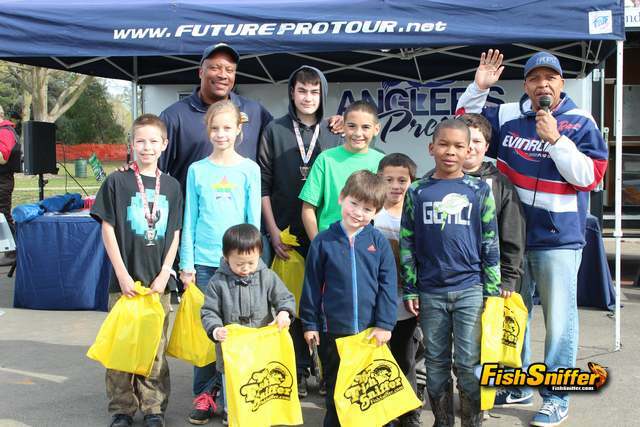 The Norcal Trout Angler Tour event at the Rancho Seco Recreation Area on Saturday, February 20 drew 150 anglers to target rainbow trout with a variety of baits and lures. 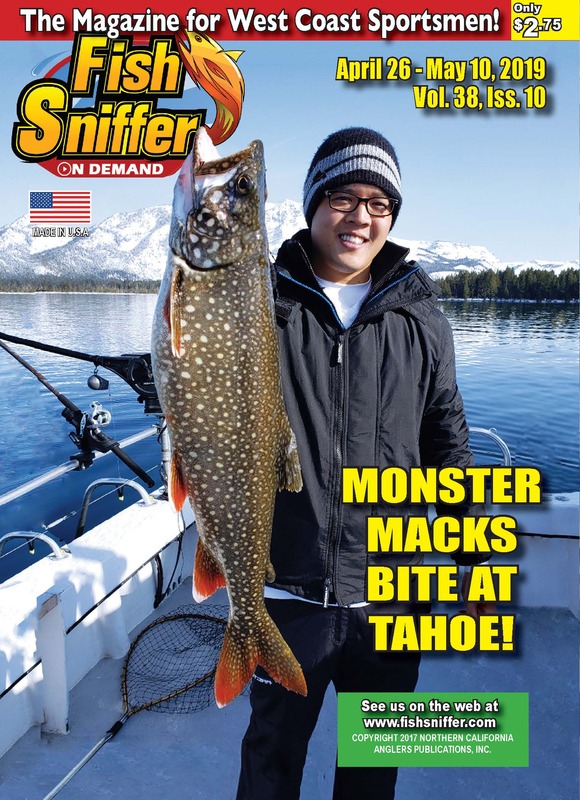 “Rancho Seco is a great venue, with lots of family friendly facilities and excellent shoreline access all around the lake,” said Vince Harris, owner of Angler’s Press and event organizer. Jessie Trejo Jr. won first place in the adult division with a 2.37 lb. rainbow trout. He landed the fish while fishing PowerBait from shore first thing in the morning. The second through tenth place winners were: (2) Jason Williamson, 2.04; (3) Maleek Johnson, 1.99; (4) Koua Xiong, 1.93; (5) Jeremiah Ramirez, 1.86; (6) James Lew, 1.79; (7) Shawn Myers, 1.79; (8) Westly Trejo, 1.75, (9) William Martinez, 1.71; and (10) Larry Butler,1.65. The eleventh through twentieth place winners were: (11) David Tabuchi, 1.6; (12) Daryl Jackson, 1.58; (13) Eddie Navarette, 1.52; (14) Christina Butler, 1.36; (15) Tom Morgan, 1.33; (16) Mike Combs; 1.29; (17) Joe Hill 1.28; (18) Dan Corbit, 1.25; (19) Armando Palacios, 1.25; and (20) Manuel Hernandez, 1.23. 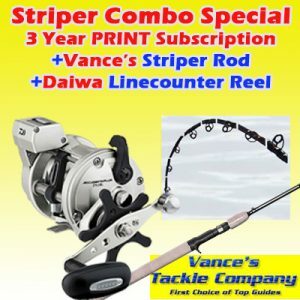 The top 50 adult finishers in each tournament are eligible to win the Grand Raffle Prize, a new aluminum boat, trailer and electric trolling motor package. 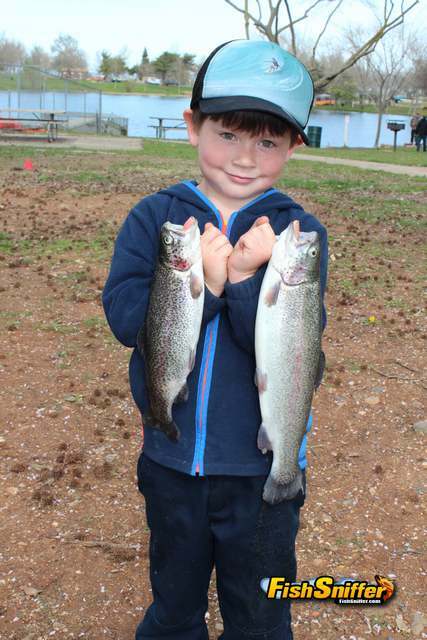 Reef Smith won first place in the Kids Division with a rainbow weighing 1.87 pounds. He was fishing from shore with his uncle, John Draper, and his mom, Deniece Smith, when he hooked the trout. The second through ninth place winners in the Kids Division were (2) Alex Shavers, 1.77; (3) Jacob Trejo Jr. 1.7; (4) Tristan Xiong, 1.65; (5) Celeste Shavers, 1.57; (6) Izayh Hernandez, 1.52; (7) Nano Martinez, 1.43; (8) Kinaro Herron, 1.1 and (9) Jesse Brito, 1.04. The top 25 youth finishers in each tournament are eligible for a chance to win the Grand Raffle Prize: A Fisherman’s Dream Kayak Rig. Mount Lassen Fish Farm planted 800 fish weighing a total of approximately 1500 pounds in the lake on Friday, February. A total of 6,000 pounds of trout have been stocked in the lake since December, according to Nick Stuart of Rocky Mountain Recreation Company. Two anglers participating in the event, Jeremiah Ramirez and Armando Palacios, found a big school of black crappie while trying to catch big trout. It was one of the most impressive stringers I’ve seen from any northern California lake in many years. All of the fish ranged from 1 to 2 pounds. The pre-event adult division entry fee was just $20, with kids 15 and under receiving FREE entry. 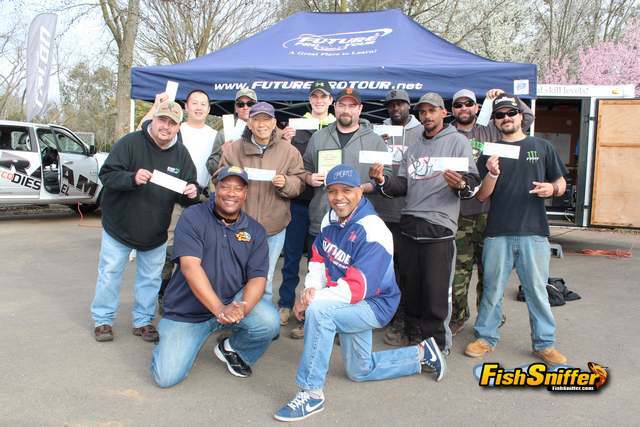 Sponsors of the event included Fisherman’s Warehouse, Berkley, Altas Mike’s,’ Pro-Cure Bait Scents, Magic Products, and Yakima Bait, manufacturer of the Rooster Tail spinner. Yakima is giving away $100 at each tournament to the biggest fish caught on a Rooster Tail. 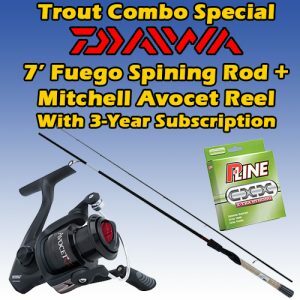 For more information on future NTAC events at Rancho Seco and other lakes, visit: www.anglerspress.com or call 916-768-0938. 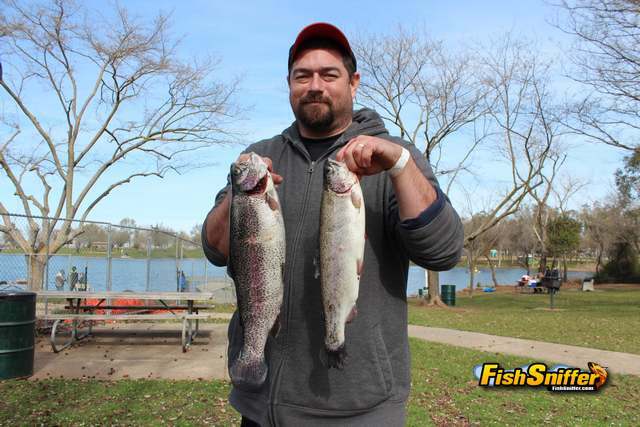 Rancho Seco Reservoir, a 120-acre year round recreational facility located in the rolling countryside between Galt and Ione, is a favorite of anglers throughout the Sacramento, Lodi and Stockton metropolitan areas. Supplied by the Folsom South Canal that diverts water from the American River, Rancho Seco was built to serve as a source for emergency cooling water in the event of a nuclear accident. After the power plant was decommissioned in a ballot measure approved by the region’s voters in November 1990, the lake became a year-round recreational facility. The lake features some of the biggest largemouth bass found in northern California, along with quality crappie, redear sunfish and bluegill. 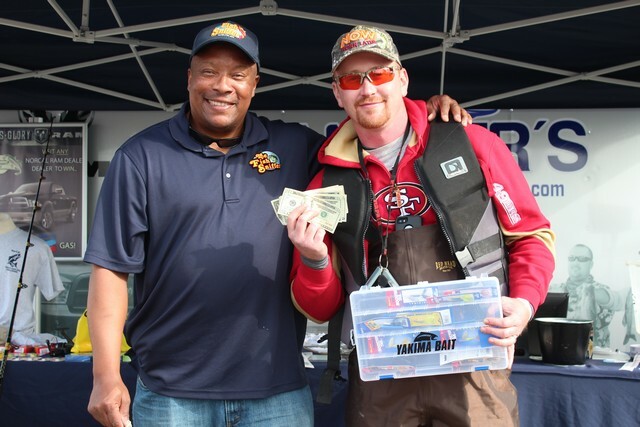 “Fish Chris” Wolfgram of Vacaville shattered the lake largemouth record when he caught and released an 18.4 lb. largemouth bass on April 10, 2003. Rocky Mountain Recreation Company is the concessionaire at Rancho Seco. The lake’s amenities feature boat rentals including aluminum fishing boats with electric motors, paddleboats, and kayaks.